My vegan and vegetarian readers will want to skip this post, I'm afraid. The book I'm reviewing was written by an extreme carnivore! Le Charcutier Anglais: Tales and Recipes from a Gamekeeper Turned Charcutier is more than a cookbook. Though it has lots of recipes, for everything from terrines and verrines to pizza and pastry, it is actually a crash course in butchery and charcuterie (the branch of cooking devoted to prepared meat products, such as bacon, ham, sausage, terrines, galantines, pâtés and confit, primarily from pork). Marc travels widely, in Europe as well as throughout Britain, spreading the word and teaching others what is becoming a lost art. It is also filled with humour. I had the privilege of reading a draft of the book long before it was published, and I remember laughing out loud and then having to read bits to my husband because he wanted to know what I was laughing at. Must warn the sensitive: the humour can be a little indelicate at times, but what can I say. Marc-Frederic (his French name) is a Lancashire lad, and when he asks you to read part of a story in a Lancashire accent, it's hilarious! I must say there is one chapter I just skimmed with one eye (offal) and one chapter I skipped entirely (blood). Those who have religious, squeamish or other reasons for avoiding one or both of those chapters will still have a lot of reading. The first chapter gives close attention to, and important specifics about, the equipment you'll need for tackling various tasks. The recipe I chose to make first, sausage rolls, is a classic British snack, perfect for picnics and parties. The recipe is on page 142 and calls for a few simple sausage ingredients and either homemade puff pastry (recipe on page 180) or frozen puff pastry. Next I'm going to make the pork pie with the traditional hot water pastry, something I've never done. But the book isn't all pork. There's beef, other meats, game, fish and fowl. Of course, the pastry chapter is my favourite. Adapted from Le Charcutier Anglais. Recipe in the book says salt and pepper to taste and mixed herbs; my adaptation lists the specific seasonings and amounts I used, which you may change to suit yourself. If you cook with grams and litres and Celsius, see my Brit Conversions page for measurements and temperatures. 1 In large bowl, combine ground pork, chopped onion and seasonings. Cover and refrigerate to chill and allow flavors to come together. 2 Preheat oven to 400 degrees. Unfold the two pastry sheets, and cut each lengthwise into two strips. In small bowl, beat the egg and water to make an egg wash.
3 Divide the sausage into four portions and roll each into a log the length of the pastry strips. Place a sausage on each pastry strip. Brush the long pastry edge farthest from you with egg wash, roll the pastry around the sausage and crimp the edge to seal. Turn the roll over so that the seam is underneath. Kind of roll it around a bit, to a length of 12 inches. 4 Brush the rolls with egg wash. Cut each roll into eight 1.5-inch lengths. Cut 2 small slashes in top of each roll. 5 Place sausage rolls on parchment-lined baking sheet. Bake at 400 degrees for about 20 to 25 minutes, or until puffed and golden brown. If you're paranoid about the doneness of pork, as I am, you might want to give it an extra 10 or 15 minutes at 325 degrees. One winner will receive a copy of Le Charcutier Anglais: Tales and Recipes from a Gamekeeper Turned Charcutier. All readers anywhere in the world who enter before 11:59 pm Eastern time Wednesday January 23 will be put into a random drawing. Winner will be announced here in the comments before noon Eastern time on Thursday January 24. If I don't hear back from the winner of the random drawing by 11:59 am Eastern time Sunday January 27, another drawing will be held and a new winner selected from the original entrants (those who commented before the giveaway deadline). 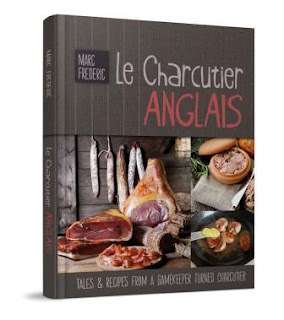 Buy It Now Le Charcutier Anglais is available online at Amazon. To enter the contest, post a comment below, and please include your email address in the body of your comment. Disclosure: The book for this giveaway is being provided by the author. I was given a copy of Le Charcutier Anglais for review, and all opinions shared are my own. They were! And so cute! Perfect for afternoon tea (I just had them with a cup of tea) or a drinks party. Although I have lived in Wales most of my life I am a Lancashire lass. I have fond memories of shopping with my mother in the indoor market. One of the delicacies I used to love was elder, similar to tripe which is from the cow's stomach but was actually pressed cow's udder. Lovely with vinegar. A food of the past I'm afraid. I have just found Marc-Frederic's blog, looks really interesting. Those sausage rolls look delicious and homemade puff pastry isn't too difficult to make. Eileen, I think he mentions that food in the book! I'm part Lancashire lass, you might say - my grandfather was right on the Lancs/Yorks border. you asked if my mother was English, no, but my mothers great grandparents were from Scotland. Thanks - sounds like an interesting cookbook! This looks like a fun book. I think that my husband would really like it. I literally had a friend ask me today what my favorite party food was, and I responded "Sausage rolls!" We lived in England when I was little and these have a special place in my heart. Sounds like a great book, and thanks for sharing the recipe! Sandra, Kelly, Steel Springs, thanks for playing! Comtesse, glad to find another sausage roll fan - I first had them in an English pub and thought they were wonderful. Judy, thank you! And I dub thee an honorary Englishwoman! Thank you for the chance to win this lovely book! Your site is a very elegant one, and I'll be back to try some of your recipes! Thanks! Would love to have this book! Have never won anything however. Taking a chance. Mary, yes, and this guy really knows his stuff. He's passionate about it. Carnivore stuff and I’m late to the table. Must say, I’m a hard sell for meat wrapped in bread. Usually end up picking off any of the latter that isn’t substantially altered by juices-of-carnivore or various condiments. But your presentation wins the day as usual, Jeani. If a hot dog had class, this is what it would look like! And the book looks like my…uh, bread and butter too! Sully, thank you! The "bread" is minimal, and you *could* put a big shmear of condiments on it. Or you could just peel it off and hand it to someone like me who prefers bread over meat! Thanks, Heidi! And they're pretty quick and easy too - with frozen puff pastry. Sometimes I make extra pastry and have it in the freezer, but this time I used store-bought and it was good. Looks so good! This cookbook looks like it would be wonderful ! Thanks, Liz! I don't think there' another book out there quite like it! This recipe sounds so good! I would love to have this cookbook! Thanks! lavenderdreamstoo at gmail dot com Hugs! Yes, I'm sure you'd enjoy it! Thanks, pauseforfood! Nope, I won't be giving those a try. I think offal is just awful, and blood is entirely out of the question! I've barely come to grips with eating meat and am careful to buy only organic, grassfed, sustainable, ethical, etc. But thanks for the encouragement! *Giveaway Winner Announced* - The winner, by random drawing, of the cookbook is Comtesse Olympe del la Tour D'Auvergne. Leslie, as soon as you send me, delightfulrepast at aol dot com, your name, address and phone number (required by shipper), the author will ship the book to you. Congratulations! If I don't hear from the winner of the random drawing by 11:59 am Eastern time Sunday, January 27, another drawing will be held and a new winner selected from among the original entrants (those who commented before the giveaway deadline). This was fun - my first Giveaway in 2013! Don't miss the next one! These look delish and would work well for afternoon tea too! Thanks for linking up here at Friends Sharing Tea. Thanks, Bernideen! I love connecting with fellow tea aficionados! Wow, how hungry does this post make me! I would love to read the book. Thanks, Kellie! It's a fun book! I have a friend who prepares sausage rolls every year for her Christmas Eve party -- a family tradition. Yummy!!!!! Maybe it can be *your* new family tradition now! ooh these look tasty, my husband would love them! Yes, I think he would, Angela - AND you don't even have to tell him how easy they were to make! HI Jean, Fab dish, it's on my shortlist for a feature. Cheers from Carole's Chatter! Carole, thank you so much! I hope your readers will give it a try! These are perfect for bite sized saviries for Afternoon Tea. Thanks for sharing! Thank you, Bernideen! They always go over well. I love sausage rolls!Great recipe!Hugs! Thank you, Maristella! Hugs to you! I agree with Bernideen's comment--these sausage rolls would be perfect for afternoon tea! Thanks, Margie. They'd be perfect for one of your office tea socials! These are nice Jean for Afternoon Tea time! Fact is, I would enjoy some right now for lunch. Thanks for sharing. Thank you, Bernideen. And you can make them bigger for lunch. I just do the tiny ones for tea. I love sausage rolls for teatime. This recipe sounds delicious. I don't need to be in the drawing, but it does sounds like a good book. 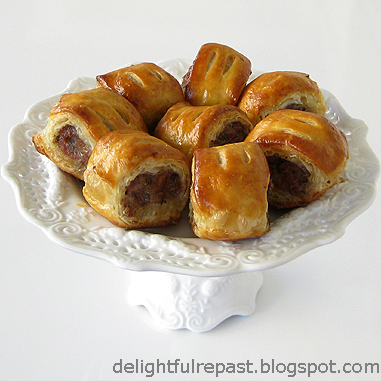 I am trying to cut back on meat, except for a little treat like these sausage rolls. Thank you, Marilyn. I eat small amounts of meat and always try to make sure it's something I'm going to really enjoy.